Last year on Valentine's Day I featured some of my library buttons with a love theme. This year I thought I would show off my specially made "I Love Libraries & I Vote" cap ("& I Vote" is on the back of the cap). 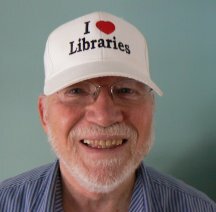 I had the cap made a few years ago as part of the Wisconsin Library Association's campaign "I Love Libraries and I Vote". The purpose of the campaign was to demonstrate to decision makers that people who feel strongly about libraries are active in the political process. Wisconsin got its inspiration for that campaign from the Library Lovers' Month promotion started by Friends & Foundations of California Libraries. Since then the American Library Association has launched its ilovelibraries.org website. The Carnegie Corporation of New York is also spreading some love with the "I Love My Librarian" Award. Love for libraries is international. I came across this testimonial of library love on the Edinburgh Eye which was written earlier this month. Just pronouncing one's love of libraries is, of course, not enough. They are in need of much more tangible support in these tough economic times for all public institutions.